A viral WhatsApp forward claiming a voter can cast their vote even if their name is on the electoral roll by asking for a ‘challenge vote’, is false. Read the full story here. 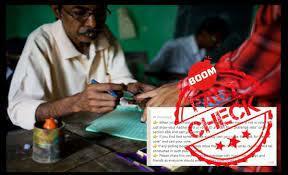 Uttar Pradesh chief minister was bribing potential voters with cash. However, the video is from when Yogi was an MP from Gorakhpur and was handing out compensation to farmers who had lost their crops. Read more about it here. An image of Bharatiya Janata Party (BJP) spokesperson Sambit Patra having a meal with a homeless couple on a pavement, is photoshopped. The picture is a composite of two separate images and was created as a gag to troll Patra. However, it is now being shared as a genuine photo. Read the full story here. 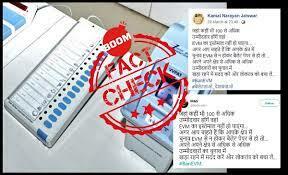 A viral message claiming that Electronic Voting Machines (EVMs) will not be used at places where there are more than 100 candidates, has been doing the rounds on social media, particularly Facebook and Twitter. 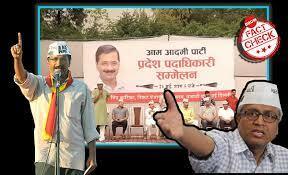 The message urges people to prop up more candidates so that ballot paper can be used instead of EVMs. But the claim is false. Read more about it here. Social media remained abuzz with all kinds of misinformation centered mainly around Kerala’s Wayanad district. A few posts claimed Pakistani flags were waved at Rahul Gandhi’s pre-nomination rally in Wayanad. However, the IUML office and IUML flag were passed of as the Congress office and Pakistan’s flag respectively. Read the full story here. Photos of Congress MP Shashi Tharoor holding cash during his visit to the famed Connemara market in Thiruvananthapuram, Kerala last week are being shared online with a claim that he was bribing his constituents to attend the gathering. 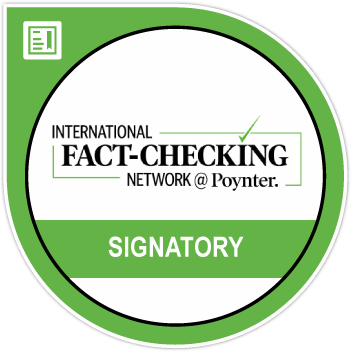 But the claim is false. Read more about it here. A video clip of former Aam Aadmi Party leader Ashutosh Gupta purporting to show him speak against the party has gone viral on social media. The video is being shared with a caption that says, “Who is former AAP leader and senior journalist Ashutosh speaking against?” But the video is doctored. Click here to read the story in detail. 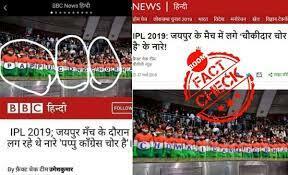 A photo purporting to show a news article by BBC Hindi that includes a picture of spectators sporting the words ‘Pappu Cong chor hai’ painted on their bodies from the Rajasthan Royals and Kings XI Punjab match held on March 25, 2019, is photoshopped. The original photo had the words ‘chowkidar chor hai’ and was shot months before the Indian Premier League began this year. Read the details here. 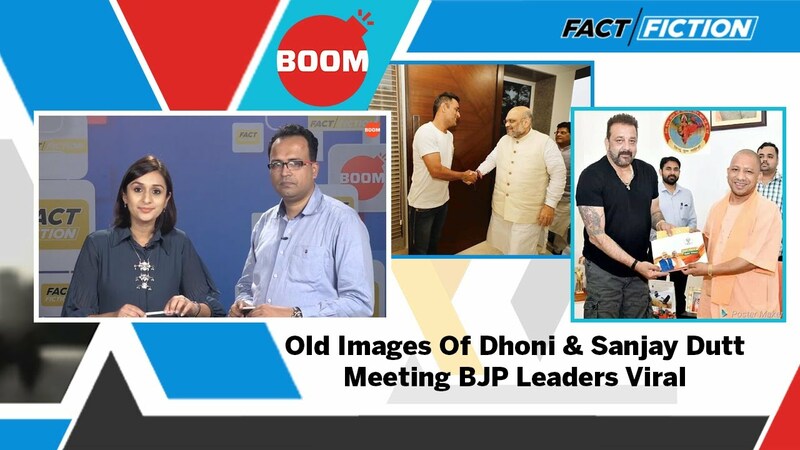 Photographs of cricketer Mahendra Singh Dhoni and actor Sanjay Dutt meeting Amit Shah and Yogi Adityanath respectively are viral with claims of them joining the Bharatiya Janata Party (BJP). But the photos are old and the claims with the two are false. Read the details here.